2 or more: $45.03 ea. This sturdy wire rack is ideal for organizing and storing puzzles. 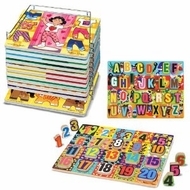 Comes pre-assembled and easily holds up to 12 standard 9" x 12" puzzles. Fits all popular 9" x 12" puzzles except Chunky Puzzles. Rack does not fit Jumbo Knob Puzzles. Sturdy wire rack is ideal for organizing and storing. Holds up to 12 standard 9" x 12" puzzles.